The 17×8 Crestone DualSport Wheel is AEV’s first dedicated wheel for the Chevrolet Colorado and Colorado ZR2 mid-size pickups. The Crestone’s split 6-spoke design gives it an ultra-modern look while providing drivers with the flexibility and versatility that AEV’s line of DualSport Wheels are known for. This wheel can be purchased with a fully-functional Beadlock Ring for running very low air pressure off-road, a Protection Ring for street use and added protection off-road or no ring with black hardware for a more simplistic look. In addition, both the Beadlock Ring and Protection Ring can be easily painted for a custom appearance. The DOT-compliant AEV Crestone DualSport Wheel is made from heat-treated A356 T6 cast aluminum for maximum strength and to minimize weight. Further, AEV thoroughly tested the Crestone wheel to stringent SAE J2530 standards. The Crestone DualSport Wheel is Tire Pressure Monitoring System (TPMS) compatible, and features a valve stem recess to protect the tire valve from being damaged out on the trail. AEV’s Crestone wheel is available in a painted Onyx finish. Beadlock/Protection rings are available in either a painted Silver or Onyx finish. No Ring – The Crestone wheel can be installed without a ring for a simple one-color look. AEV supplies black nylon hardware for this configuration to prevent dirt and debris from building up inside the threaded bolt holes. Protection Ring – The Protection Ring is a non-functional cast aluminum ring, designed as a sacrificial part to protect the wheel from trail scratches while also providing the same look as the Beadlock Ring. The Protection Ring includes Grade 8.8 hardware and is 50-state legal. Beadlock Ring – The Beadlock Ring is designed with maximum strength and off-road durability in mind by utilizing a 16mm thick, forged aluminum beadlock ring and custom Grade 10.9 metric hardware for increased shear strength and higher torque requirements. AEV recommends that the Beadlock Ring be used for off-road purposes only. Off Road Use Only: The Crestone wheel with the Beadlock Ring installed is DOT compliant but that does not necessarily mean it is legal for street use in every U.S. state. Check state and local restrictions on beadlock installation and use BEFORE ordering. Beadlock wheels must be properly installed and require routine maintenance. 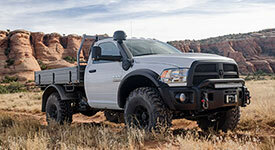 As a general policy, AEV recommends that beadlock wheels are used for off-road purposes only. AEV Beadlock Tire Compatibility: Due to the inherent variances in bead thickness between different tire models/manufacturers, the Borah/Crestone wheel is not compatible with some tires. We have confirmed that the tires listed below are compatible with this wheel. Other tire brands and models may also work but AEV only recommends using the tires listed on this chart. Tires that are not listed on this chart may have a bead that is too thick for this wheel which can lead to wheel failure, vehicle damage and personal injury. AEV will be updating this list with additional tire manufacturers and models as we test them. Please contact the AEV Sales Team at (248) 926-0256 if you have any questions or concerns about tire compatibility before ordering. This advisory affects the Borah/Crestone wheel in the functional beadlock configuration only. What are the advantages of AEV's DualSport Wheels? Beadlock wheels offer a distinct advantage off-road when running extremely low tire pressures in difficult or soft terrain. However, we recognize that many customers like the look of a beadlock but do not want to deal with the routine maintenance that goes along with installing beadlock wheels on their daily driver. AEV designed the family of DualSport wheels so they can be used as either true beadlock wheels or as non-beadlock wheels by simply swapping out the outer ring and changing the mounting position of the tire. This also allows a customer to purchase a non-beadlock wheel now and be able to upgrade the wheels later by adding the true beadlock ring. What is the difference between the “Beadlock Ring” and the “Protection Ring”? The Beadlock Ring is made from forged aluminum and makes the Crestone a true, functional beadlock wheel. The Protection Ring is a non-functional cast aluminum beadlock ring, designed as a sacrificial part to protect the wheel from trail scratches and also provide the same look as the Beadlock Ring. I am not sure which configuration I want to purchase. Can I buy the wheels now and the rings later? Yes! We designed the Crestone to look good even without a ring. If you do not want to purchase a ring right now, we can supply you with nylon bolts that are intended to be used without a ring and keep the holes nice and clean so you have no issues installing the ring of your choice when you are ready. Both the Beadlock Ring and the Protection Ring can be purchased separately online or through any AEV Authorized Distributor. AEV Crestone Beadlock Wheels are DOT compliant, doesn't that mean they are street legal in all 50 states? Not necessarily. AEV wheels are designed to all applicable DOT Standards regarding wheel construction and have passed the SAE Tests for Radial Fatigue, Impact, and Cornering Fatigue. Currently, DOT or SAE has no specific regulation or test requirements for beadlock wheels. Additionally, some states have laws against multi-piece wheel designs. This means that any beadlock wheel design would technically be illegal in these states. As a consumer, your first step should be to research your state’s laws regarding multi-piece/beadlock wheels before purchasing the Crestone wheel (with the Beadlock Ring) for steet use. AEV recommends purchasing the Crestone wheel with the Protection Ring for daily driven vehicles – this configuration IS street legal in all 50 states. As a general policy, we recommend that beadlock wheels be used for off-road purposes only. Other companies make beadlock wheels and don't claim they are DOT compliant. What makes the Crestone any different? Most companies start with a standard steel or aluminum wheel and literally cut off the outer bead and weld on a new beadlock adapter. After this major structural modification, the wheel must be completely re-tested per DOT guidelines in order to claim it is DOT compliant. Most companies don't bother with this and simply don't make the claim. The Crestone is designed and cast as a beadlock wheel, so it is tested to the same SAE standards as any non-beadlock AEV wheel. Can I run the Crestone wheel with a beadlock ring on the street? Well, assuming your state has no specific ban on multi-piece wheels, you certainly could. But just because you can, is it a good idea? That depends on you. Beadlock wheels are a specialty piece of equipment and as such take specialty maintenance and awareness to be used safely. If you want them because they look cool, beadlock wheels are certainly not for you – and that is primary reason why we designed the Crestone to be a dual purpose wheel. Proper maintenance of these wheels is critical and requires the consumer to do the initial install correctly, re-torque the wheels at least once a month, and replace all the bolts every year at a minimum. It's a good idea to develop a routine of looking over the wheels at every fuel stop, just as you would check your engine oil. Beadlock wheels are not for everyone and therefore, as a general policy, we recommend that they be used for off-road purposes only. I want to purchase the Crestone with the Beadlock Ring but I've heard beadlock wheels can't be balanced. Is this true? There are two sides to this misconception. The first goes back to the old cut and weld method of creating a beadlock wheel. Anytime a wheel is cut and welded, balance can be a major issue and often times it is the wheel causing the issue. AEV Beadlocks are cast as a beadlock and do not experience this issue. Proper balance can also be caused by improper mounting of the tires to the wheels. It is quite common for a tire to be mounted in such a way that the tire is not set on the wheel properly, and this can wreak havoc with balance. It's very important to follow the instructions when installing the functional Beadlock Ring and then drive the vehicle before balancing the tires. What is the maximum recommended tire size with the Crestone wheel? The Crestone wheel is designed for up to a 37x12.50R17 tire. I would like to customize my Crestone wheels to match my vehicle. Do you recommend painting or powder coating my wheels and rings? Painting is definitely the way to go. As a general safety precaution, AEV does not recommend powder coating any cast aluminum wheels. The heat range and duration of the powder coating process may overlap the heat treating and aging of aluminum wheels. For this reason, powder coated wheels will not be covered under AEV’s lifetime structural warranty. AEV products are usually made in the USA, so why is the Crestone wheel manufactured overseas? At AEV, we remain committed to American manufacturing, and we would much rather have our wheels manufactured in the US. But right now, you can’t get wheels made in the USA at aftermarket volumes. Still to this day, the only cast wheel plants left in the US are for high volume OE wheel programs. So unfortunately, buying from China is a necessary evil of being in the aftermarket cast wheel business. We have made the effort to buy from a high quality Chinese plant. Our plant also produces OE wheels for Volkswagen, Audi, BMW and Harley Davidson, among others. Our supplier has American employees on the ground in China who oversee our programs for us, and we have been over to China to inspect and visit the plant in person. When lower volume wheel manufacturing becomes feasible again in the US, we will be first in line. All of AEV’s wheels carry a lifetime structural warranty against manufacturer defects.